LONDON – Stirling Moss is a great admirer of Lewis Hamilton but he has distinct views about how a winner should behave on the Formula One podium. It is not that he disapproves of the champagne spraying that landed the Mercedes driver in trouble in China this month, with the Briton aiming a stream of bubbly at a hostess, but his was a very different era. “Champagne spraying didn’t really exist in my day, it was brought in mostly by (American) Dan Gurney. I think he was the first person who did it,” Moss told Reuters in an interview on Thursday. Moss, now 85 and generally recognised as the greatest driver never to win a Formula One title, can otherwise see something of himself in Hamilton — even if the 30-year-old has already won two championships. The pair are both two times winners of the British Grand Prix, with Moss the first Briton to triumph on home soil in an epic 1955 race and Hamilton the most recent last year, and both with Mercedes. The two men recently got together at the venerable Monza circuit near Milan to lap the ancient banking in the 1955 Mercedes that Moss used to win that year’s Mille Miglia (thousand miles) road race from Brescia to Rome and back. 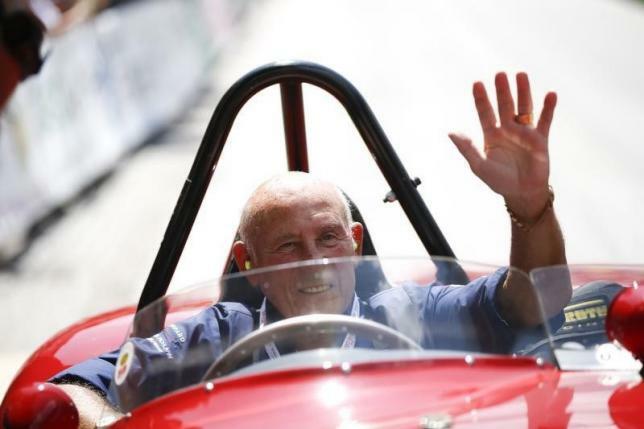 “He really was quite excited to drive the car,” said the winner of 16 grands prix and four times F1 championship runner-up, at a book launch (“Stirling Moss: My Racing Life”) to coincide with the 60th anniversary of his celebrated victory. Moss suspected that the answer would be yes, however: “I think frankly Lewis would be one of the guys who would love to have raced back in the days, because he definitely is a very fast driver,” he decided. Hamilton is currently leading the championship from Mercedes team mate Nico Rosberg by a hefty 27 points after winning three of the first four races and starting all of them from pole position. The Briton is also in the middle of negotiating a new contract with Mercedes that could be worth some $40 million (£26 million) a year for a driver who was last week listed as the richest active sportsman in Britain. For Moss, who can lay claim to being the first truly professional racing driver of the post-war era, such untold wealth belongs to another world. “I won the German Grand Prix in 1961 and that was worth 1,000 pounds,” he said. “By today’s standards, that would be 10 or 12,000 pounds. The most I ever won in a year was about 34,000 pounds. Moss, still an avid follower of Formula One even if his preferred mode of transport these days is a Renault Twizy electric car, expected Hamilton to have his third championship all but wrapped up by the time he returned to Monza. “I think he probably will. He’s got the right engine. You’ve got to have a Mercedes to win. He’s got that, he’s got the skill. He has a lot of experience. He’s been around quite a while now,” he said.